akes sheet music, or even head arrangements and insists instead of improvising, from a cold start. Keith Jarrett comes to mind, superb pianist in group contexts who, somewhere in the Seventies, elevated himself to a concert soloist, literally, with a series of multi-disc live releases highlighting his ability to extemporize melody and development. Tension and release is the key to keeping any soloing alive, an element that requires pacing; the problem with Jarrett's elongated improvisations, it seemed to me, that he too often went frameworks that supported his configurations and offered up, at extended rates, a form of noodling, riffing, a repetitive set of rills and streaming, gutless variations that lacked adventure, daring. Jarrett, unknown to him and ignored by his fans, had turned into a New Age pianist, a verbose George Winston. I couldn't wait for the man to ease himself back into band situations, which he has, and good for him, and good for us. 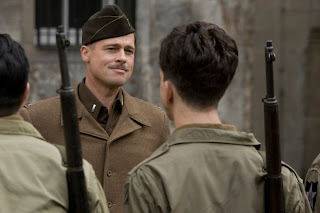 Inglorious Basterds, writer-director's Tarantino's homage and ramping up of the Men On a Mission war drama, is a flashy, occasionally gripping bit of now dated mannerisms characteristic of the filmmaker who, as Duncan Shepard has remarked, loves to hear his voice emerge from the mouths of characters he creates. The characters, though, are no more than sock puppets, and what used to pass for style in this man's work has become a shtick. One gets the feeling through the movie that the generic plot points Tarantino writes over are not notes to a melody he would lovingly embellish, but are considered as little more than a chord progression over which he has another excuse to blitzkrieg us with dazzling technique. Shtick, though, can still be fun if deployed in a lively way, and there are moments when the predilection of long monologues or convoluted stretches of dialogue that lead, at snail pace, to an expected burst of violence grabs you by scruff and bangs you around some, the obvious example being the performance of Christoph Waltz as the charming, effete, well mannered and murderous S.S. officer Col. Lada. Waltz is inspired as he embodies the self-aware elegance of a man who likes nothing better than to exterminate Jews for the Nazi command. He cannot, though, balance Waltz's performance with an effective counterweight; Brad Pitt, of late the most interesting Hollywood actor with the roles he's taken --Burn After Reading, The Assassination of Jessie James by The Coward Robert Ford-- but in Basterds he's only on screen less than half the screen time, and he is impaired beyond belief by a cartoonish Arkansas accent. Pitt has the appealing skill of vanishing inside the character's skin and letting his physicality become inhabited by another personality, full of ticks and twitches. Unlike Al Pacino, say, who battles to conquer a writer's character with his trademark rages and rasping, ranting style, Pitt's portrayals strike you as people you wouldn't look at twice; this is the talent to seem insignificant until a series of gestures and reactions reveal an unannounced agenda. Except here, significantly; Pitt looks like he's practicing his accent in a mirror while he studies the smooth curves of his face. It never becomes a comfortable fit. The Lada speeches go on for extended lengths, reprising feints, indirections and nuanced deceits of past Tarantino movies. Tarantino hadn't an outline for this film, a structure to hang his best ideas on; rather, he improvised from the outset, the result that his worst tendencies show up as often as his best virtues. Which made Inglorious Basterds a dull, grinding, unpaced endurance contest.He reached his saturation point with steroidizing movie genres with his two-part masterpiece Kill Bill, with all it's seamless and bravura conflations of different action film styles, but he has based his reputation on this one knack, or, more accurately, this habit. Death Proof was a chatty, grinding bore, with the fabled Tarantino dialogue sounding like leftover material that didn't make into Pulp Fiction or True Lies. Inglorious Basterds continues the downward spiral despite the generous reviews from critics eager to crown him an auteur, continues the downward spiral. His sleights of hand, his postmodern conflations, his promiscuous homages to film styles that drag down his narrative momentum--hard rock guitar riffing in a WW2 movie? Whoa, cutting edge stuff-- fail to lift this bit of labored pandemonium. Eccentric liberties with formula plot structures made items like Pulp Fiction and the pair of Kill Bill movies fun things to sit through, a superb blend of filmmaking panache and a young man's energy to jack up the action; even his incessant references to other movies were endearing because you sensed the director had shoved two generations of film theory to the side and resolved that movies were fun; aesthetics were a matter of making the entertainment more intense.What hasn't happened the maturation of the approach; fun can still be a value in itself, but there is the expectation that an artist has developed a finer sense of what that entails; themes ought to transform over time. The aging wunderkind remains on the same playground, though. As with Death Proof, Basterds isn't an improvement on an original idea, but rather someone of limited ideas determined to tell the same jokes over and over. It would be one thing if he were developing his themes, but Tarantino loves his riffs and mulled-over mannerisms too much to alter them, to play with them. He loves them way a thief loves his stolen booty. No matter how lovingly he polishes and resets these things, you are aware that they don't belong to him.